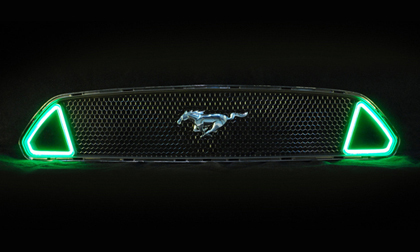 DETROIT, Mich. – Nov. 4, 2015 – Classic Design Concepts, manufacturer of unique Original Equipment quality styling products, has introduced its all-new Outlaw Mustang Upper and Lower Replacement Grille for the 2015 Mustang. Designed to work in tandem with the Mustang’s OEM system, the grille features the industry’s first fully integrated LED accent lighting. Available as an individual piece, or as part of the OUTLAW package, the new replacement grille is available exclusively from CDC. Both the upper and lower grille are injection molded and feature OUTLAW mesh inserts to help give the Mustang a clean look. On both sides, CDC has fitted long-lasting LEDs that are encased in injection molded Lexan housings. The LEDs offer superior lighting reliability, with switchback capabilities and optional color adjust LED technology that interfaces directly with the running lights or DRLs. CDC designs and manufactures products with enthusiast driven style. Each component of the OUTLAW package, including the replacement grille, can be purchased individually or combined with other components to create a muscle car image tailored to an individual’s taste. The all new CDC replacement grille with integrated LED accent lighting is available for pre-order at ClassicDesignConcepts.com or through distributors and retailers nationwide. For more information contact Classic Design Concepts at Sales@CDCDetroit.com. Founded in 1990, Classic Design Concepts is an original designer and manufacturer of unique Original Equipment quality restyling products, supplying both the Original Equipment and Aftermarket Automotive Industry. CDC prides itself on providing the enthusiast with cutting edge style and unsurpassed quality. For further information contact Classic Design Concepts, 28266 Beck Rd, Wixom, MI 48393, on the web at ClassicDesignConcepts.com or (866) 624-7997.